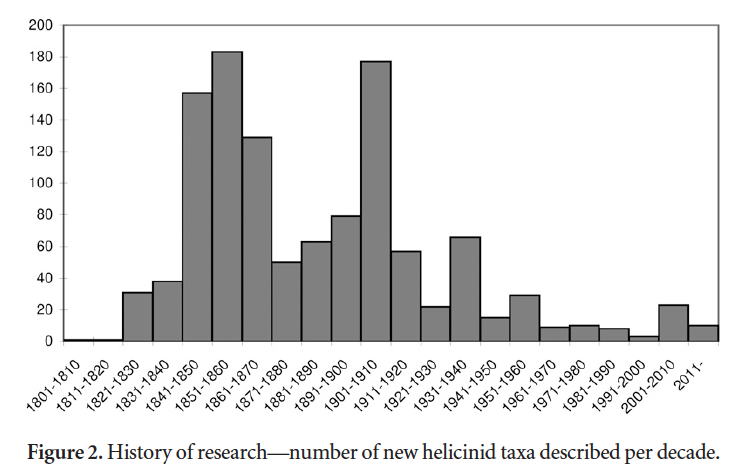 Society (2012), Ira Richling’s excellent paper on diversity of the Helicinidae was recently published (Richling, 2014). 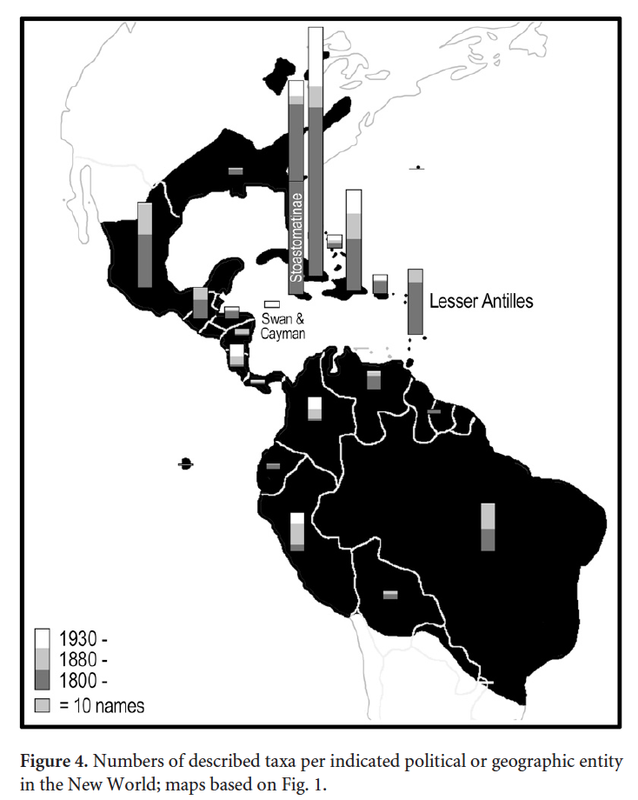 Presenting a history of helicinid research starting in 1801 (the first taxon described was a Jamaican species), she has analysed the development of the diversity through time and also a number of revisions to compare the number of accepted (sub)species to available names. Under ‘Drawbacks in exploration’ several aspects (listed below in the abstract) are extensively discussed, which have an importance beyond the scope of the paper. It would be interesting to explore these issues for other (large) land snail families in the (Neo)tropics. One of these issues is the “limited availability of wet preserved material”, which is quite crucial to make advances both in morphological and molecular studies. Unfortunately, the forthcoming implementation of the Nagoya Protocol (cf. Renner et al., 2012) makes things probably worse and opens up the possibilities for unwarranted claims from local scientists and license authorithies for financial expenditures, and more (examples are known of claimed co-authorship for several papers without any content contribution). Given the ongoing crisis in natural history museums, this is an avenue leading to disasters. The full abstract of the paper reads: “Helicinids represent a family of tropical land snails with a distribution range limited to the subtropical and tropical zones of the New World, Australasia, and the Pacific. For an estimate of diversity in this poorly systematically revised group, the total number of described taxa was determined and used for calculations based on analyses of selected case studies with regard to the percentage of valid and new taxa. Australasian and Pacific areas started much later with the bulk of taxa described between 1880–1930. An analysis of the distribution of the type localities and the times of descriptions allowed for identification of scarcely- and well-studied areas. would still be among the better documented snail families for this region. habitat loss, increasingly fragmented distribution and extinction. Another practical aspect is the rather limited availability of wet preserved material”. Renner, S.C. et al., 2012. Import and export of biological samples from tropical countries—considerations and guidelines for research teams. – Organisms, Diversity & Evolution 12: 81–98. Richling, I., 2014. Poorly explored jewels of the tropics: Estimating diversity in non-pulmonate land snails of the family Helicinidae (Gastropoda: Neritopsina). – American Malacological Bulletin 32: 246–258. This entry was posted in Uncategorized and tagged biohistory, diversity, helicinidae, literature, review on November 7, 2014 by bramb.